I love preparing homemade pizza on Friday nights. It’s been somewhat of a ritual at our house since my kids were babies. We just couldn’t afford to buy pizzeria pizza! And now, when I consider what’s in those pies, I’m glad that I established this habit long ago. Some nights, however, I just don’t have it together enough to make a yeast dough in advance. That’s when a biscuit crust comes to my aid. Whole wheat pastry flour is lighter in texture and flavor than regular whole wheat, but it’s still the whole grain. It blends up quickly and bakes up light and flaky. 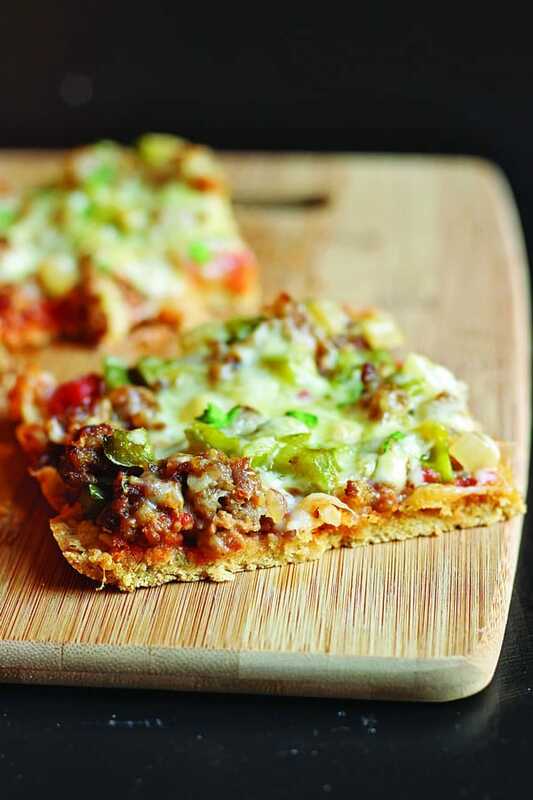 I love this pizza with or without the meat — it’s just so packed with flavor! Preheat the oven to 400°F. Grease a 9 x 13-inch baking pan with butter or coconut oil. In a large nonstick skillet; cook the sausage, bell pepper, and onion until the sausage is cooked and the vegetables are tender, about 10 minutes. Drain off the fat. In a large bowl; whisk together the flour, baking powder, herbs, and salt. Add the olive oil and buttermilk and stir gently, just until combined. Spread this mixture in the bottom of the prepared pan. Spread the tomato sauce over the biscuit layer. Scatter the meat mixture over the tomato sauce. Sprinkle the cheese over the top. Bake until the crust is crisp on the bottom and cooked through and the cheese is melted, 12 to 15 minutes. Recipe from Good Cheap Eats: Dinner in 30 Minutes (or Less!) by Jessica Fisher (The Harvard Common Press, 2015), reprinted with permission. Jessica Fisher is the creator of two popular blogs, Life as Mom and Good Cheap Eats, which have established her as a go-to authority on cooking for a family cheaply, creatively, and nutritiously. 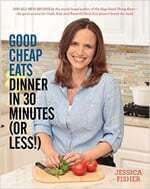 She is the author of Good Cheap Eats: Everyday Dinners and Fantastic Feasts for $10 or Less; Not Your Mother’s Make-Ahead and Freeze Cookbook; Best 100 Juices for Kids; and Good Cheap Eats Dinner in 30 Minutes (or Less!). Jessica lives with her husband and six children in the San Diego area, and you can follow her on Facebook, Instagram, Twitter, and Pinterest. 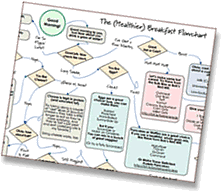 Do you know the difference between processed and ULTRA-processed? 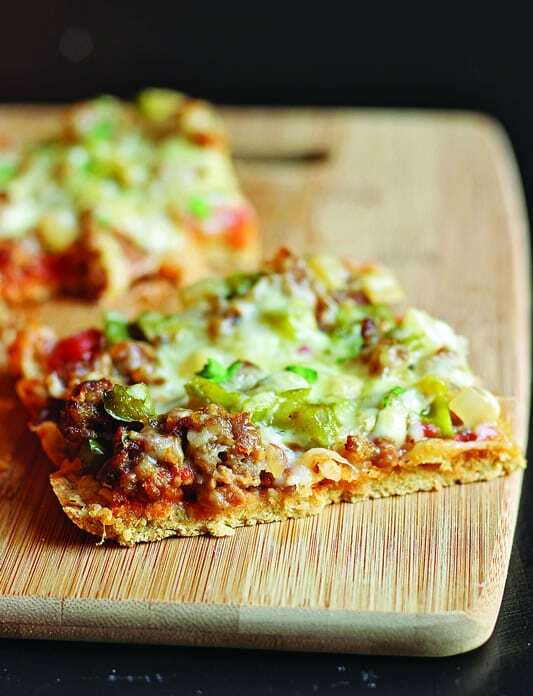 This biscuit pizza has become one of our favorite weeknight meals — as with any pizza, it’s super-flexible, and we use whatever toppings we have on hand. Thanks, Jessica!